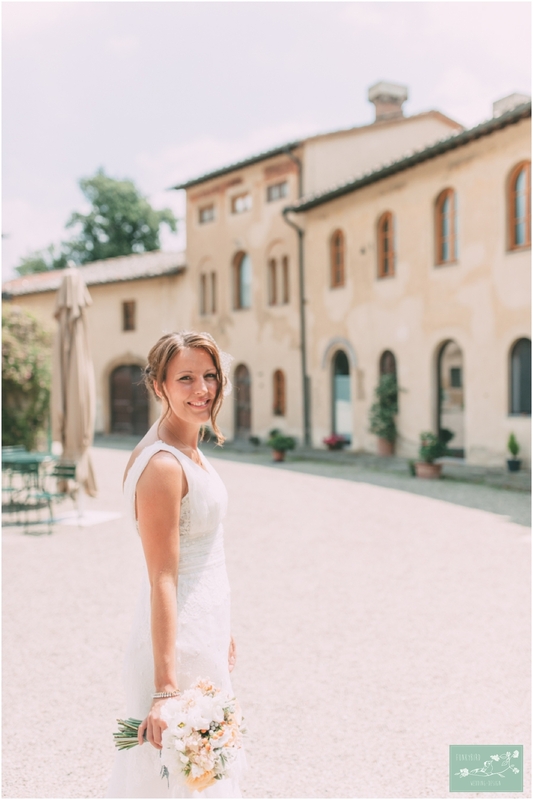 From the wedding planner: On a sunny day Willeke and Rutger came to Tuscany to find a venue and church for their wedding. I remember taking them to one of my favourite wedding locations, a romantic chapel surrounded by vineyards. Exactly as one would expect when coming to Tuscany. Upon arrival Willeke and Rutger looked at each other and knew right there and then that it was the perfect place for them. From where we were standing I pointed to the castle where we would go right after. Standing on a hilltop this castle is everything a couple might want, and after we visited it together they absolutely agreed! They wanted both the civil and religious ceremony and right next to the castle stands a romanesque church built in 1000 a.d. Perfect! It didn’t take long for them to decide and very soon after their visit we received the Save the Date and started planning their Tuscan wedding weekend with lots of personalised details such as the Alfa Romeo Spider 1600 with their wedding date on the license plate. The wedding date was also sown into the suit of the groom and of course we hàd to play around with sparklers at night to make sure none of the guests would forget 20-06-2014. 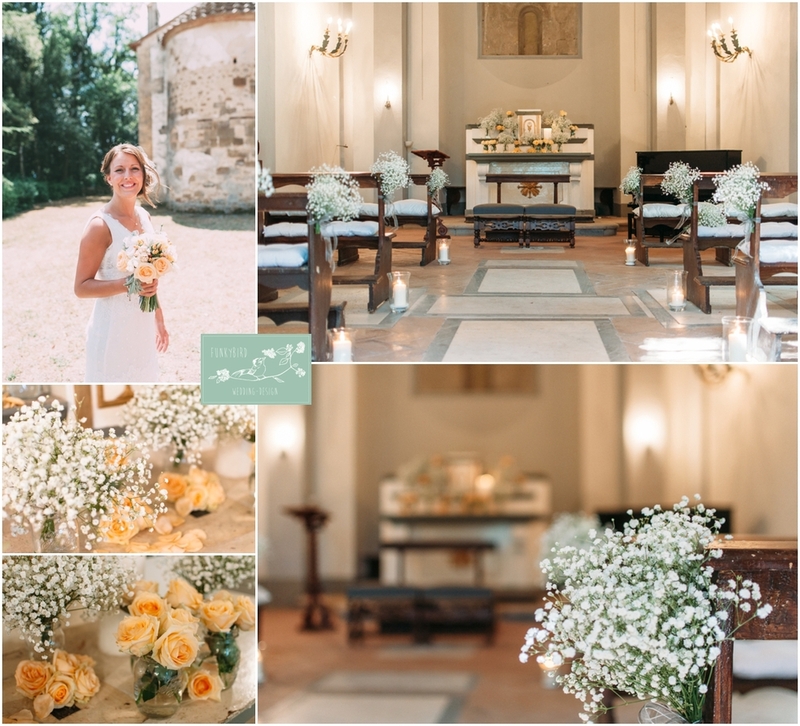 From the florist: For the church decoration we decided to go with lots of peach coloured avalanche roses and babies breath. The bouquet was a mix of peach, grey and white and looked beautiful together with the brides delicate but stunning lace wedding dress. Of course we did not forget the little flower girls and made wreaths of babies breath for them and little flower baskets to carry as they walked down the aisle. On the dinner table we decided to add some DIY elements and sprayed tin cans and prosecco bottles in gold and copper tones. All of this filled with Sweet pea, peach coloured stock flowers, hypericum berries and white lisianthus. Instead of going with the usual white candles we preferred grey ones and peach paper lanterns were hanging down from the balcony. 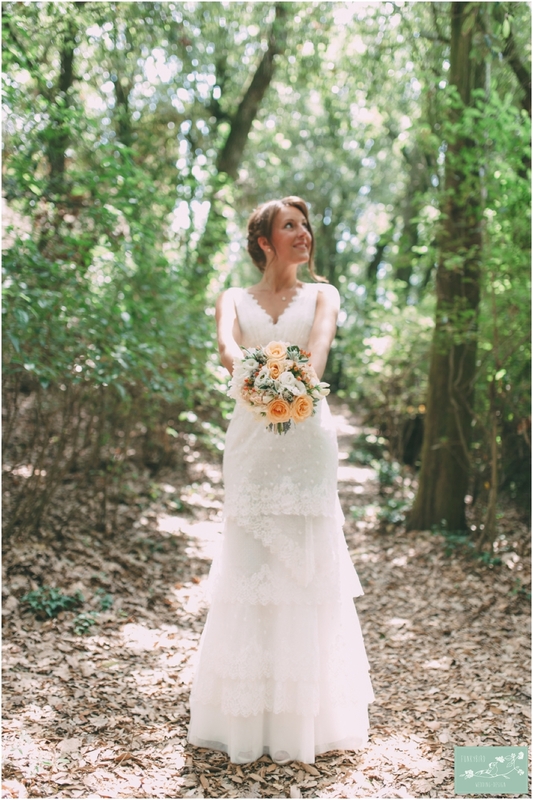 We really enjoyed working with Willeke and Rutger and FunkyBird Photography captured the whole day perfectly. The delicate colours and beautiful surroundings shine through on all the images. All photos are taken by FunkyBird Photography ©2014 No images may be used without prior written permission from the wedding photographer. 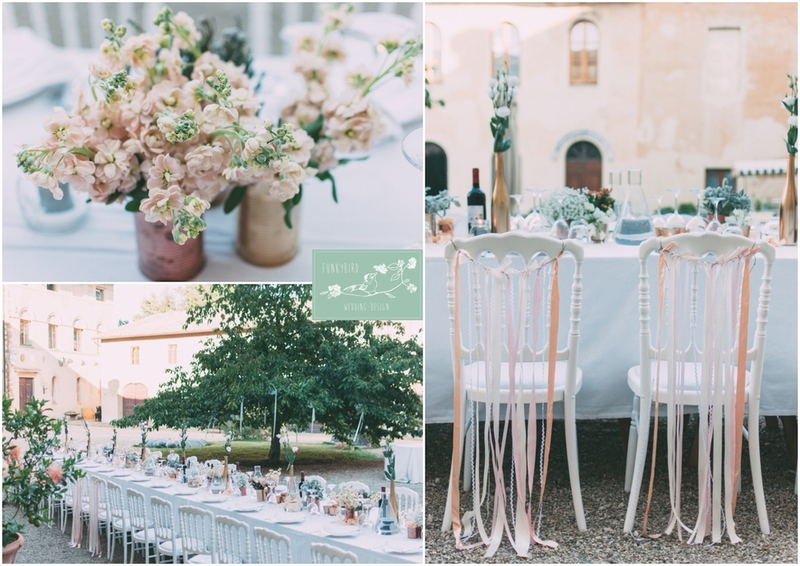 Do you want to get married in Tuscany and have your own Romantic Tuscan Wedding? Please fill out the contact form on our Inquiry page. We can arrange your wedding location, wedding venue, catering, wedding photographer, wedding flowers and many many more details!